15 March 2013: The Director of George Hwang LL.C, Mr George Hwang, delivered an hour-long talk on Intellectual Property (IP) and the Music & Entertainment Industry at the Lasalle College of the Arts. The talk was attended by music students and focused on industry practices regarding IP. Explaining that enforcing IP essentially entails the exercise of rights to restrain the use of work, George differentiated between its applications as Confidential Information and Copyright. While Confidential Information protects ideas, Copyright laws protect their expression and/or form. Students were also advised not to upload their music onto free-sharing sites – “you automatically waive most of your rights to your work by that very act.” Locally, individuals can join COMPASS, which is a body that collects royalties and passes these on to their copyright owners for the public broadcast of songs. George Hwang will deliver a second talk at the Lasalle campus covering “Fine Art and Design” on Friday, 22 March 2013 at 1pm. 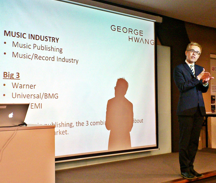 For further information on music contracts, please contact George Hwang at george@georgehwangllc.com.